Many assume teens and young drivers are today’s most distracted drivers, but a new study has surprisingly revealed a more prominent culprit: their parents. Findings revealed an alarming majority of Americans use their phone while driving (71%). Volvo Reports: Finding Focus on the Road, the fourth in a series of Volvo Reports from Volvo Car USA and The Harris Poll, reveals that while distracted driving is still an issue for all, Gen X are more likely to practice unsafe driving techniques (73%) than any other generation, including millennials. 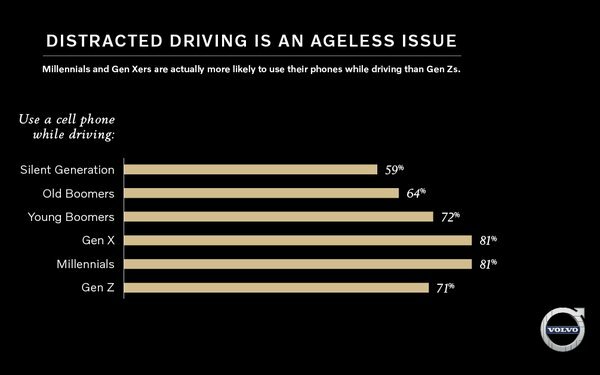 In fact, one in three Gen-X drivers even admit to using their phones while driving when their kids are in the car with them. Distracted driving is seen as the top threat to safety on the road by most Americans (55%), far surpassing driving under the influence (31%), aggressive driving (8%) or speeding (3%). Phones were identified as the top distraction (43%), yet 7 in 10 still admit to using cells while driving. And while 64% of Americans are looking for ways to cut down distractions, by far the most dedicated generation to addressing the problem is young Generation Z, with that number rising to 89%. The study also sheds light on the rise of distractions in an always-on culture. Many Americans (64%) are looking for ways to cut down on the distractions; among Gen-Z, that number rises to 89%. One third (33%) of Americans drive in silence to minimize distractions and 32% turn phones on “do not disturb” to eliminate notifications. A majority of Americans (89%) feel we need better education about the impact of distracted driving. Volvo vehicles include standard voice command capabilities and Bluetooth integration, allowing for hands-free control and communication. All of these functions combine toward Volvo’s Vision 2020, which states that no one should be killed or seriously injured in a new Volvo by 2020. The national survey was conducted online among 2,035 U.S. adults ages 18 and older, of whom 1,665 are drivers, from June 5-7. This online survey is not based on a probability sample and therefore no esti­mate of theoretical sampling error can be calculated.